We have had a busy but exciting week in Foundation Stage this week. The highlight of our week was the Tortoise coming in today. We enjoyed watching him move, holding him and talking about what he felts like. Do ask your child to tell you about it. This week we have been talking about Mother’s day and why our Mum’s are important to us. The children have shared some lovely things about what they appreciate about their Mum’s, we have had lots of comments about how kind our Mum’s are and why Mother’s day is an important day to reflect on this and show our Mum’s just how much we care about them. We have had a great time learning to tell the story of ‘The Hare and the Tortoise’ this week. We have talked about the words used in the story and new words that we have come across. Towards the end of the week we have been thinking about questions to ask and talking about whether we would rather be the Hare or the Tortoise. This week we have played parachute games in PE. Unfortunately, we have only had one session this week because of rehearsals for the year 3 and 4 play. In our Tuesday session we enjoyed parachute games. In class we have been developing our fine motor control, by ensuring our pencil grip is correct and enjoying writing in sand, paint and water. We have talked about fiction and non-fiction books this week and the difference between them. The children are getting better at distinguishing between fiction and non-fiction books. Outside we have enjoyed putting our phonics knowledge to good use and made signs for the garden to help us look after the plants. We have also enjoyed writing in our Mother’s day cards. This week we have been adding two groups of objects in order to find the total. We used lots of different objects in order to make it very visual and then record our answers. The children really impressed me with their independent work, by taking what we had been doing in class and following it up to make their own number sentences. We have talked lots about the add and equals symbols. Towards the end of the week we have started to explore different ways to make ten and have used numicon to explore all the different ways of making ten. It is great to see the children so enthusiastic and keen to engage in different mathematical activities. We have enjoyed being creative this week, making our cards for Mother’s day. 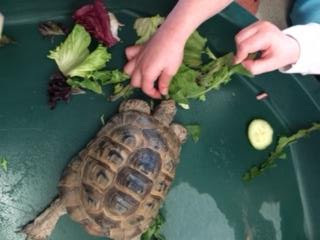 The children also enjoyed carrying out observational drawings of the Tortoise today. This week we have explored fast and slow animals and in particular the Hare and the Tortoise. We have talked about how these animals are different and thought of questions in order to further our understanding of each animal. · Eggs- including boiled eggs, egg sandwiches, mayonnaise, salad cream and coleslaw. Please make sure your child returns their homework by Thursday morning each week. During the last week of term we will be making our spring hats ready for the hat parade. We will provide the children with paper for the hat but they will need additional things to decorate them. 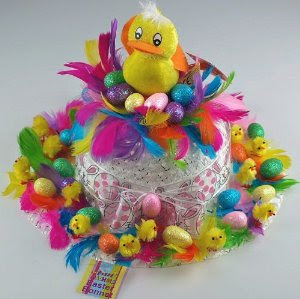 It would be helpful if you could send some additional bits and pieces for your child to use to decorate their hat,(feathers, small chicks, ribbon, glitter) please put them in a clearly named bag. These need to be in school by Monday 3rd April at the latest.